Contractor - LLC "Center of Ukrainian Internet names"
Customer - natural or legal person addressed to the Contractor for the provision of the "Backorder" service. The domain name expiration (cancellation of registration) - removal of information about domain name and its Administrator from Register. Application - duly request of the Customer to the Contractor containing all the information necessary to register an expired domain name. - the Customer, in case the Contractor received only one application for registration of an expired domain name; - the Winner of the auction, in case the Contractor received more than one application for registration of an expired domain name. Auction of the expired domain name (Auction) - institutional arrangements carried out by the Contractor in case of multiple applications for registration of the same domain name that is registered by Ukrnames.com, consisting in the preparation and holding of tender auction among the Customers for domain name administration right, determining the winner of the auction and transferring of domain name administration right to the winner of the auction. Bidder - the Customer, taking part in the auction of the expired domain name. All bidders have equal opportunities for participation; any priorities for participants in the auction are not established. Successful Backorder – domain name expiration with discontinuing of application process and successful domain name registration. Unsuccessful Backorder – domain name expiration with discontinuing of application process and unsuccessful domain name registration. Bidding process - provision of information by the Contractor to the bidders regarding successful Backorder registration and record of bids. Winner of the auction - bidder, who won bidding process (placed the final bid). Bid - bidder's offer on domain name purchase. Bid consists of domain name registration price in the corresponding domain zone plus auction step. First bid — the first application from the person, participating in Backorder. Final bid - the highest bid among all others placed by bidders. Auction step - period within which the bidder can raise the bid. End date of auction — 24 hours since the beginning of bid receipt. In case the access to the bidding process is impeded or unavailable for technical reasons, the end date of such auction may be postponed. 2.1. The application on Backorder service is the consent of the Customer to terms and conditions of the present Agreement. 2.2. In case Backorder is successful and there is a domain name application from only one participant-the domain name shall be registered according to his/her application without auction. 2.3.In case there was more than one application to participate in Backorder service and Backorder was successful, domain name shall be registered according to the order of the participant, who suggested the final bid at a private auction. 2.4. In case bidder increases a bid (the next auction step is made), the bid of the previous bidder is returned to the current balance. In case domain name is the subject to court trial, on condition that the Contractor has in possession the corresponding evidences proving that. In other cases that may lead, in judgement of the Contractor, to the violation of the rights of third parties. 2.6. 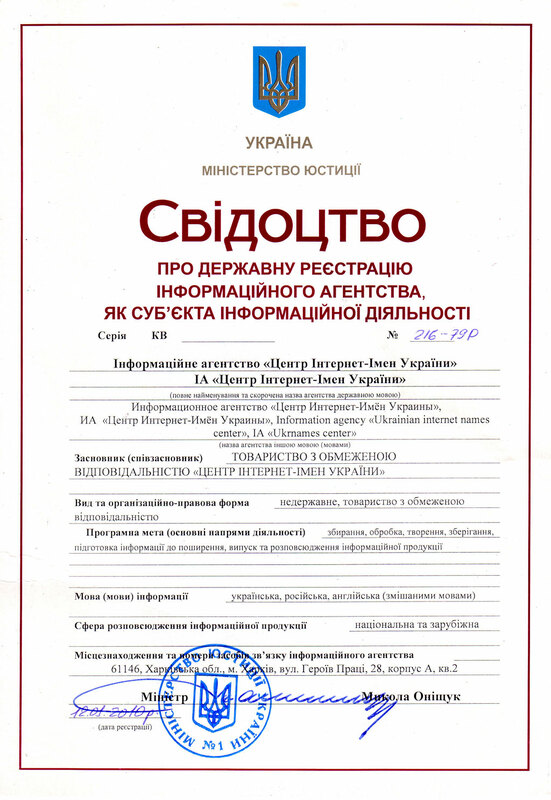 The Customer shall be obliged to follow "Terms and conditions of service use", published on a web server of the Contractor at http://www.ukrnames.com/domains/agreement.jsp. 2.7. After placing a bid on the auction, the bidder cannot cancel his/her bid. 3.1.1. The Contractor shall provide a service exclusively for domain names in the zones for which the provision of this service is technically possible (list of domain zones is determined by the Contractor). d) in other cases that may lead, in judgement of the Contractor, to the violation of the rights of third parties. 3.2.1. The application for service shall be submitted by the Customer on the web server http://www.ukrnames.com (in the section "My auctions"). b) in case the application of the Contractor was not the first among applications sent by other Registrars when registering domain name in the Register, Backorder shall be unsuccessful and the paid funds shall be returned to all the participants who left the application on the specified domain. 4.1.1. The Contractor shall preserve the right to administer the domain name till its transfer to the winner of the auction (make an appropriate entry in the domain name Register). 4.3.1. The Contractor shall notify the Customer about date, terms and conditions of the auction by sending information to the e-mail address specified by the Customer when registering on the web server of the Contractor. 4.3.2. Within the period of the auction, the Contractor shall have the right to extend its time from the specified deadline. The notification about the extension of the auction shall be done by publishing the corresponding information on a web server of the Contractor. The Customer can abandon an application for Backorder service prior to the beginning of the auction in case when his/her bid is the only one, the service did not come into effect and there are 6 (six) hours till the beginning of the Backorder. Abandonment of an application for the Backorder service shall be performed on the web-server of the Contractor (in the section "My auctions"). After the Customer's Backorder service cancellation, the amount paid shall be returned to balance. 4.5.1. Subsequent to auction the Contractor shall elect the bidder who placed the final bid to be the Winner of the auction. 4.5.2. Subsequent to auction the Contractor shall send the Winner the notification about the end of the auction to the email address specified during registration. 5.1. Service payments on expired domain name registration shall be made by the Customer from the current balance. 5.2. Paid amount on Backorder service application shall comprise domain name registration price plus the sum of the first auction bid. 6.2. By Backorder service shall be exclusively implied the registration of expired domain name,the Contractor shall not guarantee the storage of any domain SEO indices (Google PageRank, Yandex CY, etc.) before and after domain registration.